Last night, Husband and I had roasted Brussel sprouts, salad and yogurt with blueberries for dinner. 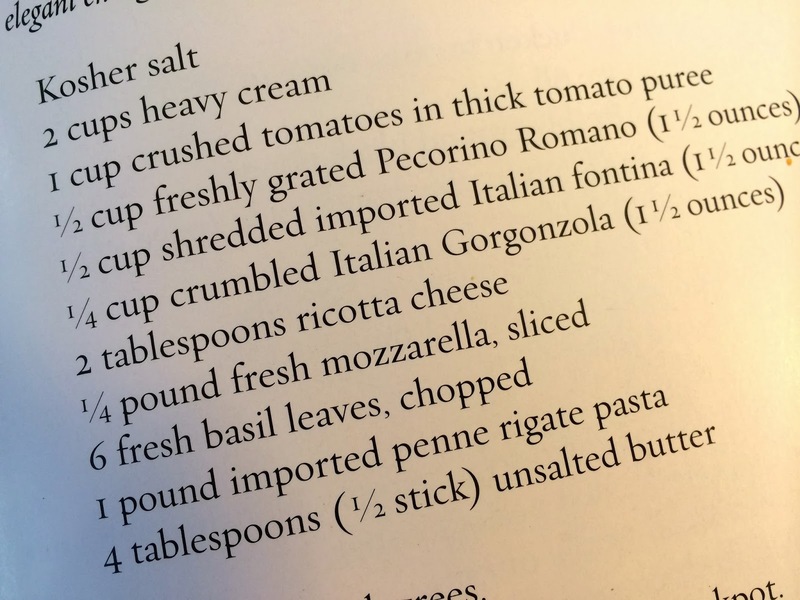 We were still making recompense for indulging in the pasta I served for Valentine's Day...an unhealthy but ever so delicious recipe I got from BAREFOOT CONTESSA Family Style (find it here). I've made it a couple of times...on both occasions for a crowd...because it is amazingly easy to prepare (and serve family style) for a large gathering AND because the fat, cream, and carbs in its ingredients list definitely relegate it to the special occasion category. It freezes well, a fact my college son appreciates since he took home the remains of said occasion this weekend. I made no substitutions in the recipe, but did bake it in a large serving dish rather than individual gratins. BTW, a good many of the recipes in this book lend themselves to entertaining. Easy and surefire delicious food, but in my mind...mostly too unhealthy to feed the family (despite the cookbook's title) on a regular basis. Bring 5 quarts salted water to a boil in stockpot. Combine all the ingredients except the pens and butter in a large mixing bowl and mix well. Drop penne into water and parboil for 4 minutes (don't overcook!). Drain well and add to the ingredients in the mixing bow., tossing to combine. Divide past mixture among 6 shallow ceramic gratin dishes. Dot with butter and bake until bubbly and brown on top 7-10 minutes. I served it with breadsticks, salad...and red wine of course. Oh....and my friend's red velvet cupcakes for dessert. If you're being naughty, might as well go all the way.